Orange Mountain, the most notable peak on Mt. Cardigan's southeast ridge, features open ledges similar to Cardigan's which provide extensive views, including an excellent look at Mt. Cardigan itself. The hike begins at AMC's Cardigan Lodge. Note: Cardigan's slopes are home to a network of ski trails as well as of hiking trails, creating an intertwined system of summer and winter trails. To avoid confusion, AMC has marked the hiking trails with its classic brown signs and the ski trails with blue signs. Ski trails are not mentioned in this description, so just ignore any paths with blue signs. From the parking area, head out on the wide dirt path, an access to many campsites. Quickly pass Back 80 Trail on the right, then Nature Trail on the left in 0.1 miles. In another 0.2 miles, fork left onto Holt Trail. In 0.1 miles past this, the other end of Nature Trail enters on the left. Climb easily on the wide dirt path for 0.4 miles, then cross the bridge over Bailey Brook. The trail continues along the brook on the other side but soon climbs away. In 0.3 miles, reach Grand Junction and turn left onto Holt-Clark Cutoff (also called Cathedral Forest Trail). In less than 0.1 miles, turn left again onto Vistamont Trail. The trail ascends very gradually through the forest for 0.6 miles, crosses Clark Trail, then descends 150 feet to cross a brook. It now begins to climb more steeply, switchbacking rapidly up the mountainside. After a bit of climbing, the trail enters a mossy conifer forest and proceeds out onto the first ledges, where there is a good view to the south. The trail continues up through the forest, then continues back out onto exposed ledges. Soon after crossing a huge, sloping ledge, the trail reaches a junction with Skyland Trail, where there are wide views to the north and east. The rocky dome of Mt. Cardigan rises above you to the north, with its sub-peak Firescrew to the left. To the northeast is a good perspective of the White Mountains. 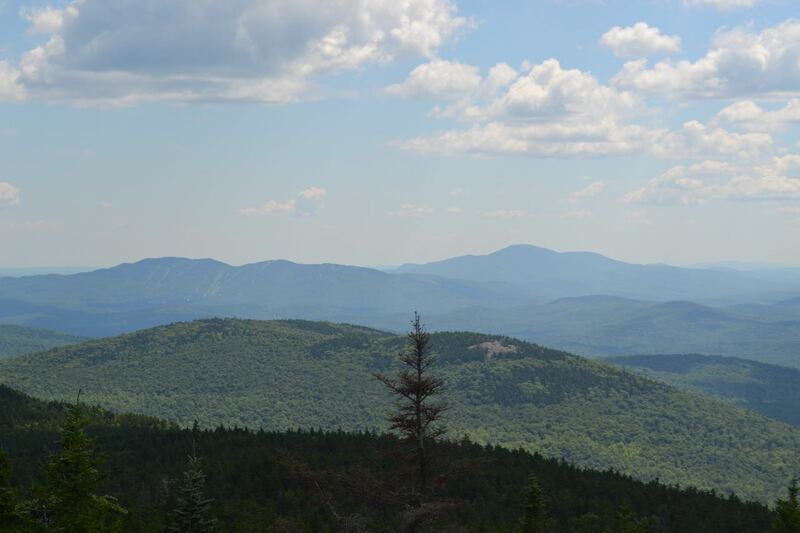 To the east, in the distance, is the Ossipee Range, with Newfound Lake in front to the right. This spot offers the best place to sit down and enjoy the view, but there are more views at the summit. Bear right onto Skyland Trail and continue a short distance to the summit. Here, follow a herd path to the left and up onto another ledge with a view to the southwest at Ragged Mountain and Mt. Kearsarge.